Both anemometer and temperature sensor are already connected to the outdoor unit. The outdoor unit is battery powered and sends data to indoor unit every minute. The indoor unit is connected to internet and sends all data received to windguru.cz server. Rotate the pin of the anemometer at least 20 times (the bottom pin where the wind cups will be attached), this will start the radio transmission, untill you do this the transmitter unit is in sleep mode and does not send any data to receiver (good for transport). Connect the indoor (black) unit to internet using the included ethernet cable. Power up the indoor unit by connecting the included power adapter, LEDs on the unit start blinking. By default the station reads network configuration from your network automatically using DHCP protocol, so in most cases you don't need to do anything special, just connect. If DHCP is not available on your network you will have to setup network manually (see below). Anemometer should be installed in an open area without obstacles where wind can blow smoothly. Ideal height for measuring wind speed is about 10 meters above ground. The cable that connects the anemometer to the outdoor unit is about 12 meters long. The temperature sensor should be installed in a shady area. Ideal height for measuring temperature is about 2 meters above ground. The cable that connects the temperature sensor is about 1 meter long. The bottom of the transmitter unit with cables must point down to the ground! If possible it's preferred to mount the outdoor unit to a place without direct sunlight. Data between the outdoor and indoor unit are transfered wirelessly, maximum distance between the units is about 400 meters (in ideal conditions = in case of direct visibility), any walls or other obstacles between transmitter and receiver will shorten the working distance significantly! As the main function of windguru station is to measure wind, in case you need to make a compromise, points 1. and 4. are the most important. If not yet, connect and power up the indoor unit at it's final position. Position the outdoor unit on the place where you choosed to install it. Do this before final mounting of the anemometer. 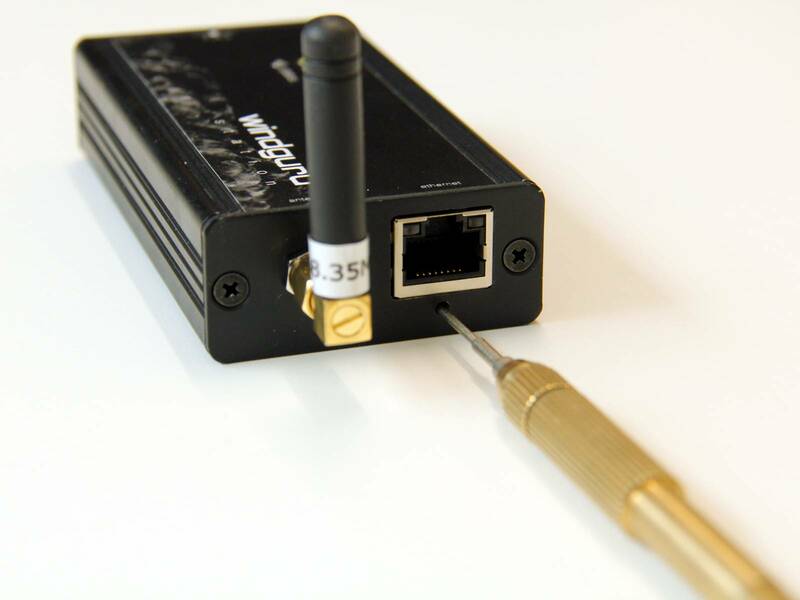 Now we need to check that the radio connection between transmitter and receiver is stable and everything will work fine. 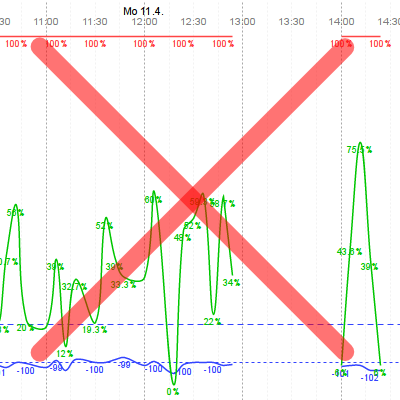 Watch the status graph at stations.windguru.cz it will provide useful info about signal strength and quality, if the values are below minimum recommended levels then try to reposition the units for better reception. Secure the outdoor (white) unit. Use cable ties included or your imagination. The bottom of the transmitter unit with cables must point down to the ground! The station admin on our server is always available at stations.windguru.cz it allows you to manage your station, edit it's registration, view status (like battery, local IP, transmission status, signal power and quality), you can download measured data to your computer for further processing, configure widgets for your website. If you don't know what IP address you should assign to your station, ask your network administrator. Make sure the indoor unit is connected to the same network as your computer and powered up. Download Ethernet Configurator: zip file 533 kB (MS Windows only). Unzip and run the .exe file inside the EthernetConfigurator directory. 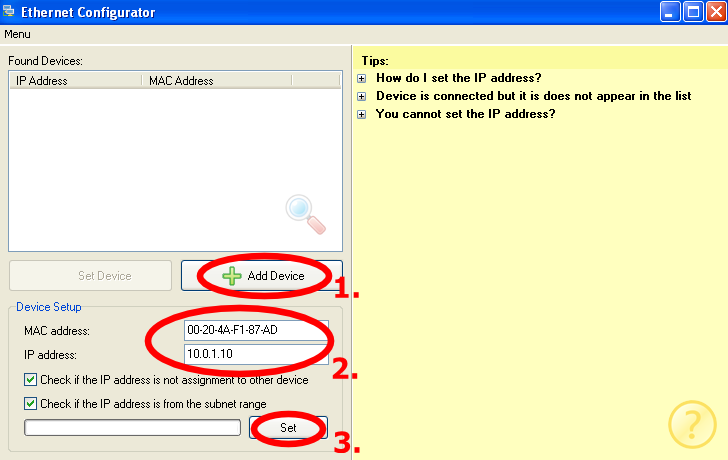 If succesful, the station IP / MAC should appear in the "Found devices" field. Now you can connect to your station by opening it's new IP address in your browser, station internal website will appear. In the internal site click "Settings" to open the configuration page where we will finish the station network configuration. Now you only need to update "Netmask" and "Gateway", if unsure ask your network administrator. 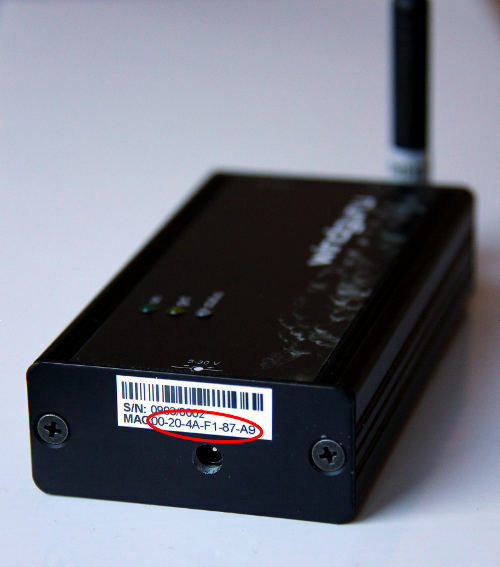 Windguru station use google DNS server by default (8.8.8.8), works fine in most cases. If you need you can change DNS to your preference.Finally click [Save] to store the new configuration. Anemometer direction - default is 0 (north), in case you did not mount the anemometer in north direction enter the real direction as degrees. For more info see Direction calibration of this maual. Warning! If you did direction calibration server side the value entered here must be 0. Either will work, but do not use both methods together, otherwise the wind direction will be recorded wrong. Calibrate using the internal site if you plan to watch the measurements also on the local internal website of the station. If you are not planning to use the internal site to see current measurements (most cases), it's safe to calibrate server side. 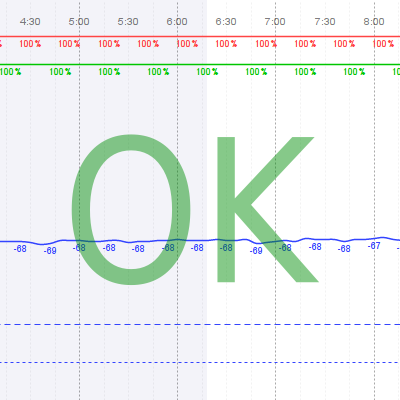 If you choose to calibrate in internal site, login to your station by opening it's local IP address in your browser, then switch to settings tab, enter the measured number into the "Anemometer direction" field and save. 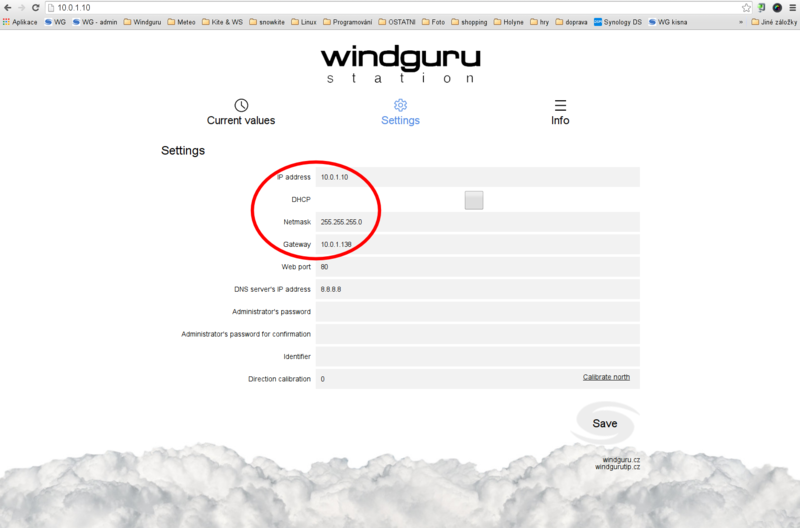 Or, login to the station admin on windguru server, then click the edit button and enter the mesured directions to "Anemometer direction calibration" field and save. Default configuration is: read network settings using DHCP, no password for internal site, DNS server 8.8.8.8, no direction calibration. The battery (CR123A - lithium 3V) should keep the outdoor unit alive for about 3 years. The station reports current battery status in the internal website and sends the status to our server so you can see it in the station admin too. We will also notify you about low battery by mail. Attach the cover back, make sure it's angled right so that the seal fits! Fasten the screws firmly.